To order a Hard Copy of "...When You're Having Fun" or "Shallow Water Blackout"
Check out the new songs at CBC Radio 3 and the Tempus Fugit Myspace Page. Brutopia 2011 footage from April 8 2011 and When You're Having Fun CD Release show footage from November 12 1999 added. Archival footage of Youthquake 1988 June 3rd from The Concert Hall added. Thank you everyone for coming out to our CD Release show last night. It was a blast for us and your support is truly appreciated! 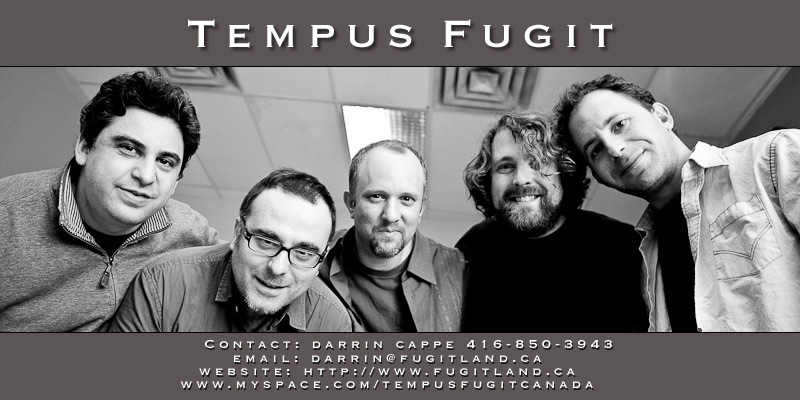 Tempus Fugit was a prize winner at the iStars Sonic Bids Talent competition held on Feb 6 2011. We got a 4 Star review on the Sea Of Tranquility website! Fugit will be participating in the iStars SonicBids Talent Contest on Sunday February 6 2011. 2 Shows have been planned. A CD Release party at Tranzac Club in Toronto on Saturday February 26 2011 and a show at Brutopia on Friday April 8 2011 in conjunction with the Marillion Weekend. Shallow Water Blackout officially released. 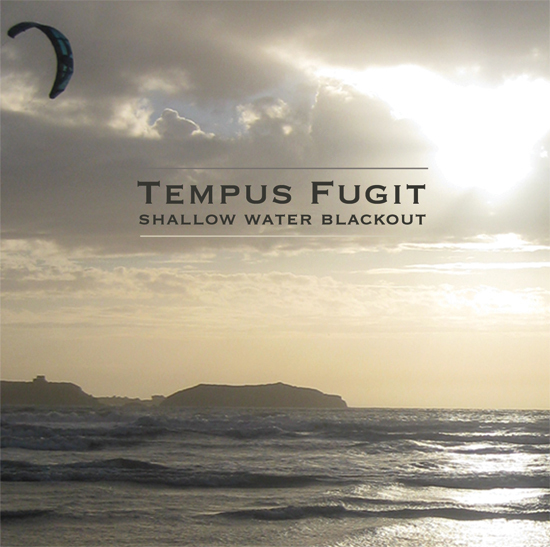 Tempus Fugit will be holding their first practice tonight since recording Shallow Water Blackout in Jan 2008. Prepping for a Q1 CD release party and possibly an April show in Montreal. NEW ALBUM "SHALLOW WATER BLACKOUT" CURRENTLY IN PRODUCTION - RELEASE DATE NOVEMBER 2010. CD RELEASE PARTIES IN THE WORKS. Final Master Shallow Water Blackout CD completed at Vyner Road Recording Studio. Mastering of the new album is under way. Final Mixes were completed on June 2nd and 3rd 2010. New Path and Soap Stains run through board. Migrations, New Path and JAD run through board. Final tweaking of ProTools mixes and first mixes through the Board - Migrations done. Secondary Mixes of Do You Know What I Mean? and The Poetry Song done. Secondary Mixes of Presence and Migrations done. Secondary Mixes of Dodgy and Shallow Water Blackout Done. Additonal bvox added to Presence, Shallow Water Blackout and Migrations. Premix of Do You Know What I Mean? done. Premix of Just Another Day done. Premix of New Path done. Premix of Soap Stains and Ashes done. After several false starts we have finally began mixing the "new" album. Premixes have been completed for Drownproofing (August 7), Dodgy (August 12), Shallow Water Blackout (August 20), The Poetry Song (September 1), and Migrations (September 2). Darrin has been assisting Elliott Sairan from Vyner Road Recording Studio on the pre-mixes. Short History of the band added. Also Band page added to the CBC Radio 3 site. Video of the September 9 1998 show at the Reverb added - this was the feedback from hell show. Lost In Flight added to Demos section at http://www.fugitland.ca/LostInFlight.shtml. These are various songs from various factions of Fugit from 1987-1998. Fugit enter the studio to begin work on Fugit 2. See updated History part 9. Audio and Video from High School Battle Of The Bands November 7 1987 show added. Photo sections added under Media. Youthquake, Star Search, Mackenzie Rocks, Thornlee shows added. Battle Of The Bands, Ildikos, YM Rocks shows added. El Mocambo Saturday September 18 1999, Clinton's Tavern Friday November 12 1999 CD RELEASE PARTY, Clinton's Tavern December 2 1999, Lee's Palace Tuesday January 18 2000, Clinton's Tavern Friday February 4 2000, Clinton's Tavern Friday March 10 2000, Clinton's Tavern April 14 2000, Clinton's Tavern May 19 2000, Clinton's Tavern June 24 2000 All Request Show, Porky's Bar And Grill July 22 2000, Clinton's Tavern August 25 2000, The Horseshoe Tavern October 2 2000, The Horseshoe Tavern November 30 2000, The Labyrinth Lounge - February 3 2001 shows added. Clinton's Tavern December 18 1998, Goulash Party Haus April 18 1999, El Mocambo June 15 1999, The Big Bop July 13 1999, Clinton's Tavern August 6 1999, The Cameron House August 24 1999 shows added. The Lion Thursday July 2 1998, El Mocambo Wednesday July 29 1998, Clinton's Tavern Thursday August 20 1998, The Reverb Wednesday September 9 1998, Lee's Palace Wednesday September 23 1998 shows added. Lee's Palace March 30 1998, El Mocambo May 6 1998, and Lee's Palace May 26 1998 shows added. FHFX 1986 and Hillstock 1987 setlist and photos added. Forum and Guest Book added. Shallow Water Blackout (aka Fugit 2) added. 7Hz Release Your Sphincter and the Unmastered version of "..When You're Having Fun" added. Beyond The Barrier and "...When You're Having Fun" added.